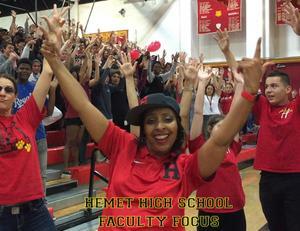 Nyesha Williams was selected as the Faculty Focus Friday employee for high schools. Nyesha is the Assistant Principal of Curriculum and Instruction at Hemet High School and she is doing an amazing job bringing the team together. She is working hard to build a Guidance Department that supports the school’s vision where every student will graduate with the necessary skills and knowledge to attend college, a technical/professional program, or other post-secondary training in pursuit of their career of choice. She is an exceptional dancer and has led our Kiki Challenge and Lip Sync Challenge, together garnering more than 40,000 views. She has an incredible spirit and extraordinary ability to build relationships with students! Her mantra is Make Today Amazing - and she lives by it daily! Thank you, Nyesha, for your commitment to Bulldog Country!